Home > Front end componets > Pedals/Acc. This heel riser / pedal adapter is perfect for Rookie drivers that need to shorten the length to the gas and brake pedals. 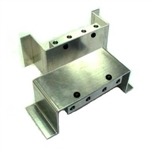 Adjustment block can be mounted on top or underneath mount.